Pakalert Press » People Lineup to Get Microchips Implanted in their Hands! Mark of Beast is On Its Way Here! People Lineup to Get Microchips Implanted in their Hands! Mark of Beast is On Its Way Here! VeriChip (now known as PostiveID) meets all the criteria that could give the Antichrist the ability to ‘mark’ every human being and prevent them from buying or selling anything. VeriChip is a RFID microchip that can be inserted into human flesh. Today it is used to microchip people who have medical conditions and will be used under Obamacare. It is the same technology used to tag animals to help reunited a pet with its owner. In October of 2004 it was cleared by the Food & Drug Administration. According to the VeriChip website RFID solutions are currently in use in over 5,000 installations worldwide including: healthcare, security, government, industrial markets, and more. The Bible declares anyone receiving this ‘mark of the beast’ will be eternally damned. The mark of the beast will not result in eternal damnation. It will not result in eternal damnation because people will not be aware of what they are being forced to accept by being implanted by an RFID chip. Many people will also be implanted without their knowledge. Technology exists to implant nano sized implants that are invisible to the human eye that grow inside the body. 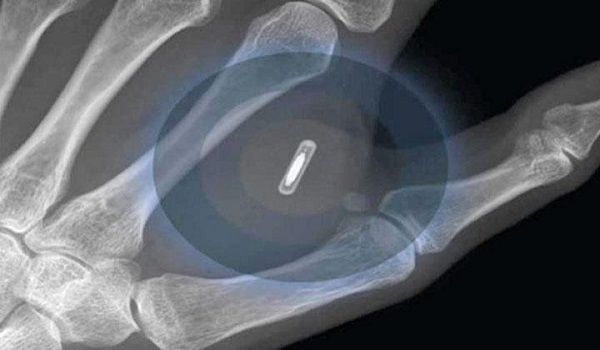 The RFID chip will be used to track, control, offer commerce, identification and pacify individuals and groups using varying levels of electrical shocks and could also be used to control thought and actions. The two ultimate aims of mandatory vaccinations with RFID chips are to neutralise opposition against the New World Order by use of toxic vaccines that destroy the brain through tainted vaccines using bacteriophages and to ensure humans are eradicated by use of fatal electrical shock to the central nervous system by use of broadcast and communication technology (such as microwave and other electromagnetic signal broadcasts) after the majority of the human population is chipped in order to pave the way for the New World Order. The New World Order is controlled by reptilians posing as humans and the reptilians want to replaces humans with reptilian/human hybrids. Unfortunately the reptilians will fail as will the New World Order. As for the rapture no consciousness will remain on planet Earth before it’s destruction by Nibiru/Planet X which will only occur after nuclear World War 3. Consciousness that is not evil will be separated from evil consciousness prior to the destruction of the physical universe. For the ones that will be left behind after the RAPTURE or the return of JESUS for the belivers. you are now without excuse. you now will understand what is going on . to refuse this mark is to accept JESUS and be beheaded for him. this is and will be the only option for you under antichrist. BUT you will instantly be in the PRESENCE of GOD and return with JESUS at Armageddon.with all of the other saints. iven if you believe NON of this its ok. AT LEAST PUT IT BACK IN YOUR MEMORY BANK. you will believe later. which is very very soon. You can probably count the years on one hand. it is that close. GET 3 DVD,s The 4 blood moons by Mark Biltz The Harbinger and the Shmeita by Johnathon Cann. Dont know if these are spelled right. both of these men are JEWISH RABBIS versed in the scriptures. also BORN again belivers in JESUS. study all of the accounts of fallen angels and GIANTS in scripture. you will get the picture. The flood of Noah Genesis ch,s 5 and 6. Joshua and Caleb killing 31 kings and all the inhabitants of the land.in the book of Joshua. Moses did the same with 2 kings before Joshua. Sodom and Gamorrah. they went after strang flesh. they wanted the angels. the list goes on. now Antichrist is going to do it with corrupt DNA. Read your scriptures. if satan can destroy all humanity. the scriptures stop. he could not be judged. all scripture has to be fullfiled. concerning Armegeddon. Jesus himself says. if I dont return now ther will be no man left. we will do no injustice to the scripture by sayinsg THERE WILL BE HO HUMAN BEINGS WITH MY DNA, THE IMAGE OF GOD, LEFT IF I DO NOT RETURN WHEN I DO. THERE HAS TO BE HUMANITY LEFT FOR THE MILLENNIAL REIGN 1000 YEARS OF CHRIST. WITHOUT THIS SATAN WILL NOT HAVE TO FACE THE GREAT WHITE THRONE JUDGEMENT. REMEMBER ALL SCRIPURE HAS TO BE FULFILLED OR NONE OF IT CAN. i used the term visible mark. should have said a real mark. it can also be implanted. but it is a real physical device. it will alter your DNA to something less than Human. the mark IS a visible mark. there is a lot leading up to this. veri chip is one of them. you are not and cannot receive the mark till antichrist comes. this mark only coms from him. read the scriptures. according to the Genesis account. God calls him the seed of satan. seed means OFFSPRING. of satan himself or the fallen angels. his DNA is not the DNA of a man. he is a Hybred.Nephilim. Alien what ever you want to call him. his mark will alter the DNA of any and all HUMANS that receive it. No longer in GOD’s image so you cannot and will not be redeemed. lost for eternity. the plan of salvation is only for true HUMANITY. in the IMAGE,DNA of CHRIST.This was why all but 8 indiviuals died in the flood of Noah. they were no longer Human. could not be redeemed. “The Mark of the Beast” is FIRST a spiritual mark visible to angels and demons, caused by the individual’s DISOBEDIENCE to the commandments of YHVH Elohim and of his Son, Yeshua of Nazareth. EVERYONE who habitually and unrepentantly disobeys ANY (Leviticus 5:17) of the commandments is guilty and will suffer accordingly. “For it is because of these things that the wrath of God will come upon the sons of disobedience.” (Colossians 3:6) This being the case, the vast majority of humankind ALREADY HAS “the mark of the Beast”. For these people, accepting a physical mark will just be icing on the cake. REPENT, we beg you, and be saved!